wedding | Scuffalong: Genealogy. wedding – Scuffalong: Genealogy. Pittsburgh Courier, 20 June 1936. Socialite Clara B. Braswell‘s mother, Mattie Amelia Brewington Braswell, was a daughter of Joshua L. and Amelia Aldridge Brewington. 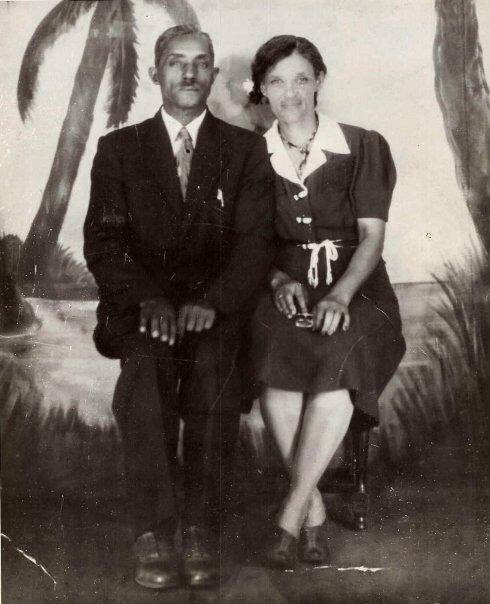 Just after 1900, Mattie migrated to Norfolk, Virginia, where she married her husband, who was also a Wayne County native. Several of her siblings also made the move, including Tilithia Brewington King Godbold Dabney, much-beloved by my grandmother. Among the out-of-town guests noted at Clara’s nuptials were Mattie Braswell’s first cousin and his wife, Zebedee and Jennie Ridley Aldridge, with three of their children. The son of John W. and Louvicey Artis Aldridge, Zebedee had also migrated from Dudley, Wayne County, to rural Brunswick County, Virginia, in the first decade of the 20th century. Zebedee and Jenny traveled a hundred miles from their farm to attend his cousin’s gala wedding, touching evidence of enduring ties among Robert and Mary Eliza Balkcum Aldridge‘s descendants. Zebedee and Jennie Aldridge, probably 1940s. Photo courtesy of L.D. Hutchinson. Hat tip to B. Jones for the article. “That’s your wife.”; or, finding the Perrys. Wilson News, 21 September 1899. I came across this article using my great-grandfather’s name as a search term. Mike Taylor was an usher at this wedding and, look, so was his brother-in-law Edward Barnes. Mike’s daughter Maggie Taylor, my grandfather’s sister, then about 13, was a maid of honor, and his daughter Bertha Taylor, 7, was a flower girl. 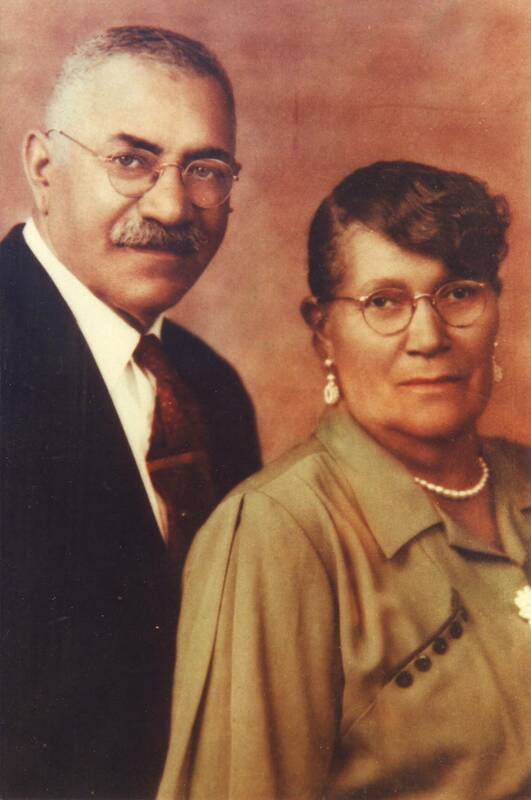 The bride and groom were Henry Perry and Centha Barnes. Were either of them related to the Taylors? “Perry” rang a little bell. In the 1910 census of Wilson, Wilson County, living along the A.C.L. Railroad: 42 year-old railroad laborer Pierce Barnes, wife Mary, 34, adopted son Robert Perry, 8, and Mary’s father Willis Barnes, 72. Mary was my great-grandmother Rachel Barnes Taylor‘s sister. 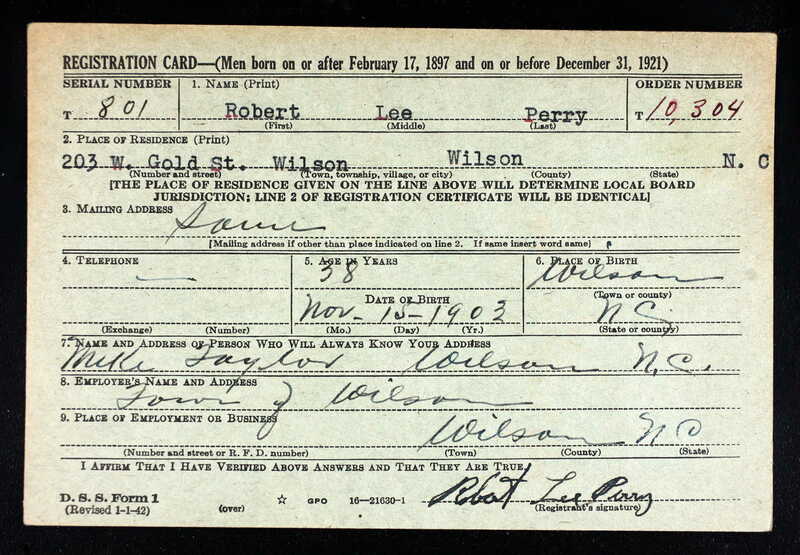 In the 1920 census of Wilson, Wilson County, at 114 Lee Street: Mike H. Taylor, cook at cafe, wife Rachel and their son Tom Perry, 12. So Tom Perry was the son of the couple that married above. But what was Tom’s relationship to Robert Perry, who was adopted by Mary Barnes Barnes and served as informant for Tom’s death certificate? And how were the Perrys related to Mike Taylor or his wife Rachel Barnes Taylor? 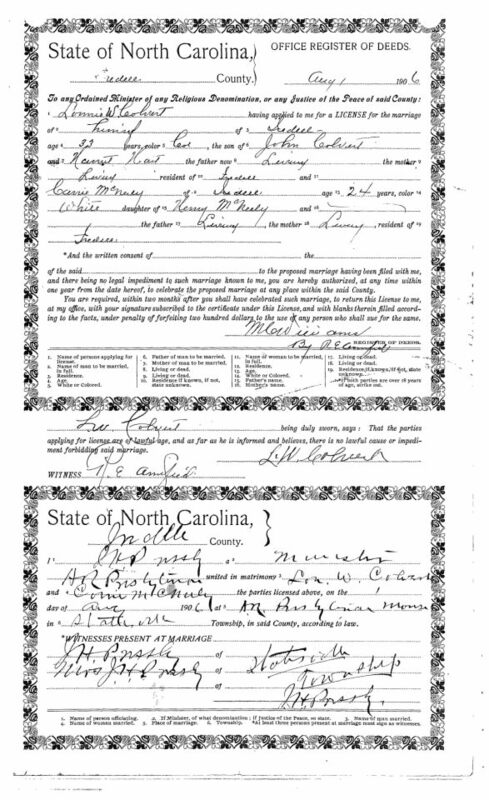 I found Henry and Centha Barnes Perry’s 1899 marriage license. Henry was 24; Centha, 18. 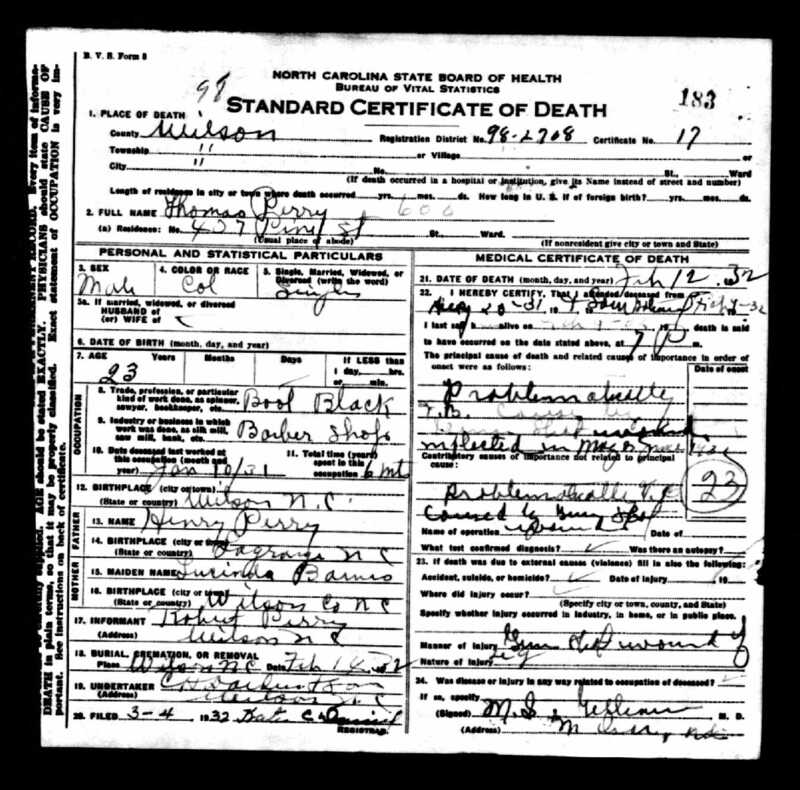 Both Henry’s parents were listed, but only her father, Willis Barnes, was. In the 1880 census of Wilson township, Wilson County, Willis Barnes appears with his wife Cherry, six of their children (the youngest aged about 4) and a niece. By 1900, and probably long before, Cherry Battle Barnes was dead. Had she had one last child, Lucinda, called “Centha,” in 1881? Let’s say Cherry died in or shortly after childbirth. Her oldest daughter Rachel, who married Mike Taylor in 1882, likely would have reared her baby sister with her own children. (The oldest, my grandfather, was born in 1883.) The 1890 census might have captured this family together, but those records were destroyed by fire. By 1900, Centha (“Sindie”) and her new husband Henry S. Perry were living together in Wilson, as yet childless. Ten years later, however, Henry was listed as a single man boarding at the New Briggs Hotel, where he worked as a bellboy. The back of the card notes that Robert Lee Perry was 5’11”, 155 lbs., had a scar under his left eye, and had brown eyes, black hair and a dark brown complexion. “Mike Taylor,” the person who would always know his address, was not the Mike Taylor who had been an usher at his parents’ wedding. Rather, he was that Mike’s son, Roderick “Mike” Taylor, Robert’s first cousin and my grandfather. Robert Perry died 15 May 1977. His death certificate lists no parents. On the occasion of the 107th anniversary of the marriage of Lon W. Colvert and Caroline M.M.F.V. 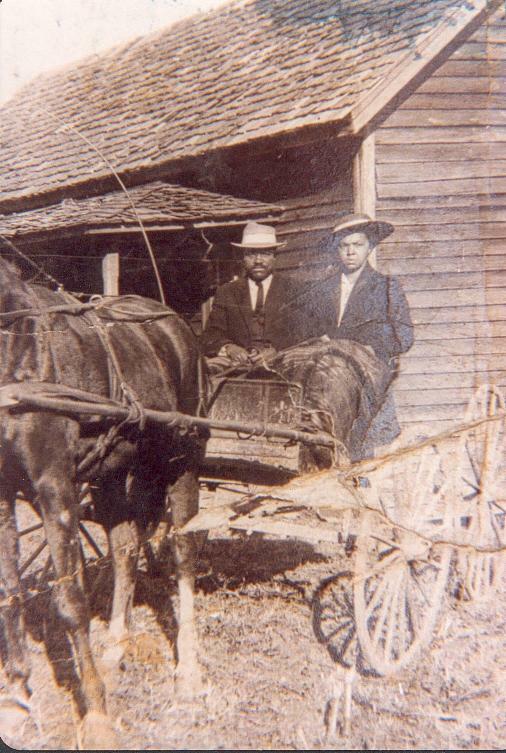 McNeely, my great-grandparents.